Edinson Vólquez…resides in SantoDomingo, Dominican Republic during the offseason with his wife, Roandry and twin daughters, Eylin and Aylin (11/5/13). also 8/3/09…agreed to terms with Texas on a minor league contract covering the 2018 and 2019 seasons on 2/16/18 as he continued his rehabilitation process…was on the Round Rock (AAA) disabled list for the entire season and spent bulk of the year at the Rangers' facility in Surprise, Ari…Texas purchased his contract from Round Rock (AAA) on 11/20/18. Made career-high 34 starts, going 10-11 with a 5.37 ERA (189.1 ip/113 er). His 34 starts tied for second most in Majors, behind only David Price...Made at least 31 starts for fifth straight season, joining James Shields, Max Scherzer, Jon Lester and Madison Bumgarner as only others with at least 31 starts in each season since 2012...Posted 6-4 record with a 5.11 ERA in 19 home starts, compared to a 4-7 mark and a 5.71 ERA on the road...Posted lowest single-season Interleague ERA (0.84) since cross-league play began in 1997 (min. five starts)...Went 3-1 against National League opponents with a .203 average against (24x118)...Went 5-4 with a 3.67 ERA (61.1/25) over first 10 starts (April 3-May 24), including 3-0, 1.09 (24.2/3) over first four...Went 3-6 with a 6.22 ERA (68.0/47) over 12 outings from June 3-August 3...Had 10th-highest first-inning ERA (5.82) in American League (min. 25 starts); allowed 22 earned runs in first inning of first 23 outings (8.61 ERA), but held opponents scoreless in opening frame of final 11 starts (August 9-October 1)...Went 5-2, 4.56 ERA (98.2/50) vs. AL Central foes, earning one win vs. Cleveland, two vs. Detroit and two vs. Minnesota...Made six starts against the Tribe, matching Club record for most starts in a season against one club...Made second career Opening Day start, tossing 6.0 scoreless innings in 4-3 win over the Mets in a rematch of the 2015 World Series...Had season-high 10 strikeouts in 5.2 innings, April 10 vs. Minnesota; marked first time a Royal had 10-or-more strikeouts in less than 6.0 innings since Blake Stein (11 in 5.2 innings) on June 17, 2001. Edinson won 13 games for the second-straight season and topped the 200.0 inning mark for the first time in his career in his first season with Kansas City...led the club with 19 quality starts, matching his total from 2014 with Pittsburgh...Went 8-4 with a 3.48 ERA and a .236 opponents' average in his 16 starts at Kauffman Stadium…his eight victories at home tied for eighth in the American League...A long-time National Leaguer, he went 3-0 with a 2.67 ERA in five Interleague starts…tossed a 6.0-inning complete game in a rain-shortened 3-2 win over St. Louis on May 23...Went 8-4 with a 3.31 ERA before the All-Star break and was 5-5 with a 3.82 ERA after the Midsummer Classic...Held the opposition to a .202 batting average (38-for-188) with runners in scoring position, which ranked fifth among qualifying A.L. hurlers…he also allowed just nine extra-base hits with RISP for the second-lowest slugging pct. in scoring situations (.250), trailing only Baltimore's Wei-Yin Chen (.239)...Named the Royals Pitcher of the Month in June…posted a 4-1 record and a 3.64 ERA in the month...Opponents batted just .103 against him (7-for-68) with a full count…held the opposition to a .175 average (70-for- 399) with two strikes...Worked a season-high 8.0 innings in his first start of the year, April 9, in a 4-1 win over the White Sox...Tossed 7.0 scoreless innings, allowing just three hits, in a 6-0 win over the New York Yankees on May 17…it was his longest outing of the season without giving up a run...Tallied a season-high nine strikeouts in his May 29 start at Wrigley Field, however he did not factor into the decision on a rare blown save by the Royals 'pen...Recorded a pair of scoreless frames in relief on October 4 at Minnesota, pushing him over the 200.0-inning mark…it was his only relief appearance of the season and first since April 3, 2014 vs. the Cubs...Served a five-game suspension, April 27-May 2, for his part in an on-field altercation at U.S. Cellular Field on April 23...Made five starts during the postseason, posting a 1-2 mark with a 3.77 ERA, holding the opposition to a .186 batting average...Set a Royals record with 23 strikeouts in a single postseason, while his total tied for fifth among all 2015 participants… also pitched the second-most innings (28.2) by a Royal in one postseason...Recorded a postseason-high eight strikeouts in his Game 3 start in the ALDS at Houston…his total also tied for the second-most by a KC hurler in a postseason game, trailing only Dennis Leonard, who fanned nine in Game 4 of the 1978 ALCS...Earned his first postseason victory in Game #1 of the ALCS vs. Toronto, tossing 6.0 scoreless innings, allowing two hits with four walks and five strikeouts...became the fourth Royals starter to record 6.0 shutout frames or more in a postseason game, joining Danny Jackson (1985), Bret Saberhagen (1985) and Yordano Ventura (2014)...Made two starts in the World Series…did not earn a decision despite allowing just four earned runs over 12.0 innings in Game 1 and Game 5...was not with the club during Games 2 or 3 after his father, Danio, passed away hours before his Game 1 start. Edinson signed a two-year free-agent contract on December 29, with a mutual option for the 2017 season...Spent his only season in Pittsburgh, leading the club in wins, innings, starts and ERA...His 13 victories represented his highest total since winning 17 games with Cincinnati in 2008...Went 8-5 with a 3.06 ERA (36 ER in 106.0 IP) in 18 games (17 starts) at PNC Park...Posted a 5-2 mark with a 3.01 ERA (29 ER in 86.2 IP) in 14 starts on the road...Ended the regular season with a career-best 18.0 consecutive scoreless innings...Posted the second-lowest ERA (1.08) in the National League during the month of September, trailing Chicago's Jake Arietta (0.95)...Beginning on June 23, went 9-1 with a 1.85 ERA (23 ER in 111.1 IP) over his final 17 starts…his ERA was the fourthlowest in the Majors during that span, trailing only Clayton Kershaw (1.41), Corey Kluber (1.77) and Jon Lester (1.82)...Made his season debut on April 3, tossing 2.0 innings of scoreless relief vs. Chicago, his sixth career relief appearance...Won his first game with Pittsburgh on April 17 (11-2), allowing 2 runs in 7.0 innings of work…lost four straight decisions before picking up second victory (3-1) vs. Washington on May 22...Tossed second career complete game on July 10 at St. Louis in a 9-1 victory, allowing one run on six hits...Complete game victory capped a four-game winning streak...Went 2-for-53 (.038) with two RBI, three walks and eight sacrifices at the plate...Suffered the loss to San Francisco in the Wild Card Game (8-0), allowing five runs on five hits over 5.0 innings. Went 1-0 with a 4.35 ERA in three starts for the Dominican Republic during the World Baseball Classic in March...Went 9-12 with a 5.71 ERA (170.1ip/108er) and 142 strikeouts in 33 combined games (32 starts) between San Diego and Los Angeles (NL) during the regular season...Tied career high (third time) in starts...Led league in runs allowed and ranked third in walks...Began season with the Padres and lost each of his first three starts (12.1ip/17r/16er)...Pitched 7.0 scoreless innings and did not walk a batter on 4/24 vs. Milwaukee...Won three straight starts from 4/24 thru 5/5...Connected off Toronto's Ramon Ortiz for first career home run on 6/2; a three-run shot in the second inning at Petco Park...Gave up season-high 11 hits and nine runs in a no-decision (2.1ip) at Colorado on 6/7...Tied career high (second time) with seven walks on 6/22 vs. Los Angeles (NL)...Won back-to-back starts on 7/20 and 7/25...Threw just 42 pitches (0.2ip/6r/5er) in final start with San Diego on 8/23...Was designated for assignment on 8/24 and became a free agent on 8/27...Signed with the Dodgers on 8/30...Made lone relief appearance (fifth career) on 8/30 (1.0ip/0r)...Posted a 2.38 ERA (11.1ip/3er) in his last two starts with Los Angeles...Was active for the N.L.C.S. vs. St. Louis, but did not make an appearance. In his first campaign with the Padres made a career-high tying 32 starts (also, 2008), working 182.2 innings pitched, the second-most innings pitched in a season in his career (196.0 IP in 2008).Tossed 16 quality starts in 2012, the second-most of his career(20in 2008) and second-most on the team behind Clayton Richard's18 this past season.His 174 strikeouts in 2012 were also the second-most of hiscareer (206 in 2008).Held hitters to a .236 (160-for-679) average, the ninth-best mark among all qualifying National League pitchers.Issued a career-high 105 walks, the most among all National League pitchers and tied for the most among all MajorLeague pitchers (also, Ricky Romero, TOR)...his 105 walks in 2012 were the most by a Padres pitcher since MattClement walked a franchise-record 125 batters in 2000...105 walks tied with Tim Lollar(1984)for the seventh-mostever in a season by a Padres pitcher.In 17 starts at Petco Park in 2012, was 6-5 with a 2.95 ERA (33ER/100.2 IP), a .208 (74-for-356) opponents battingaverage and 99 strikeouts against 56 walks, with the Padres 9-8 in his starts at home.Over his final eight starts at home from 6/24-09/30, went 5-1 with a 1.90 ERA(10 ER/47.1 IP), a .196 (33-for-168)opponents average and 46 strikeouts against 27 walks, with the Padres 6-2 in those starts.In the first half of the season went 5-7 with a 3.52 ERA (42ER/107.1 IP) over 18 starts before going 6-4 with a 5.02ERA(42 ER/75.1 IP) in 14 starts after theAll-Star Break.Received a 3.40 (69 RS/182.2 IP) run support average (runs scored while in the game) overall, the fourth-lowestaverage among all qualifying National League pitchers and fifth-lowest in the Majors.Started the Padres home opener on 4/5 vs. LAD, his Padres debut...took the loss after allowing three runs, twoearned, over 5.0 innings pitched...also started the Padres last home game of the season on 9/30 vs. SF, his lastgame of the season...did not factor into the decision.Had two games with a season-high 10 strikeouts on 7/5 vs. CIN and 8/20 vs. PIT, tied for the most strikeouts bya Padres pitcher in 2012 (also, Jason Marquis on 6/18 vs. TEX)...his 10-strikeout game on 8/20 was the ninth ofhis career.Struck out 174 batters total in 182.2 innings in 2012 for an 8.6 K/9 ratio...over his final 16 starts from 6/30-9/30,struck out 94 batters in 88.1 innings for a 9.6 K/9 ratio over that span.Tossed a complete game one-hitter on 7/19 vs. HOU, a one-hit shutout...only hit allowed was an infield single toMatt Downs...became the third shutout ever pitched by a Padre at Petco Park and first since Jake Peavy tossedone on 8/23/05 vs. HOU...first one-hitter tossed by a single player in Petco Park history...first one-hitter tossed inSan Diego by a Padre since Kevin Brown on 8/16/98 vs. MIL.Had a stretch of 16-straight starts with three-or-more walks issued in each start from 5/17-8/10, the longest suchstretch in Padres history and the longest such stretch by any pitcher since LHP Tony Saunders walked three-or-morein 21-straight starts for TB in 1998...was the longest such stretch by a National League pitcher since LHP FernandoValenzuela also walked three-or-more in 16-straight starts to end the 1987 season for LAD.Did not walk a batter on 9/19 at ARI, the fourth game of his career without issuing a walk, and third start...first gameto not issue a walk since a start on 9/25/06 at LAA, a span of 109 games, 108 starts, between the two games...onlyother start without issuing a walk was on 9/14/06 vs. LAA. Split his season between CIN and Triple-A Louisville after being named the Reds' Opening Day starter for the first time in his career...Posted a 6.35 ERA (36 ER/51.0 IP) in 10 starts before being optioned to Louisville on 5/23...returned to CIN on 6/7...optioned again on 7/7 and recalled 9/3 after rosters expanded...returned to the rotation on 9/11...Allowed at least one run in the first inning in nine of his 20 starts...twice allowed home runs to the first two batters of the game. Came back from right elbow surgery to make 12 starts for the Reds...from 2/22-7/16 was on the60-day disabled list recovering from 8/3/09 surgery to repair the torn ulnar collateral ligament ("Tommy John")and torn flexor mass in his right elbow...beginning 6/12 went 4-0, 1.45 in 6 rehabilitation starts at Lynchburgand Louisville before making his 2010 debut on 8/17 with an 8-1 win vs the Rockies...went 3-2, 6.17 in 8starts before he was sent to the bullpen on 8/28 after apps on 8/18 and 8/23 in which he allowed 10 runs in5.1 innings...the start on 8/23 at SF was the shortest of his career (0.2ip, 5h, 5er, 3bb, 1k)...on 8/31, beforehe pitched for the Reds in relief, was optioned to Dayton to make room on the roster for Aaron Harang, whocame off the DL to start that night's game vs Mil...while with the Dragons made 2 starts (0-0, 1.38) before theirseason ended...on 9/7 rejoined the Reds at Coors Field and on 9/11 vs Pit started the 10-inning, 5-4 win...after he rejoined the club on 9/7 went 1-1, 1.95 in his last 4 starts of the season...on 9/28 vs Hou started theReds' 3-2 win that clinched the division (6ip, 7h, 2er, 12bb, 8k)...produced 7 quality starts, including each ofhis last 4 apps...in his 12 starts the Reds went 9-3 and scored 60 runs (5 r/g)...started Game 1 of the NationalLeague Division Series at Phi, a 4-0 loss in which Roy Halladay threw a no-hitter...from 4/20-6/13 was on MajorLeague Baseball's suspended list for testing positive for a banned substance...during spring training went onthe 60-day DL to make room on the roster after the club signed free agent OF Jonny Gomes. On 8/3 had season-ending surgery to repair the torn ulnar collateral ligament ("Tommy John")and torn flexor mass in his right elbow (Dr. Timothy Kremchek)...twice was on the disabled list, from 5/22-5/31 with mid-back spasms and from 6/2 through the remainder of the season with the elbow injuries...left hisstart on 5/16 at SD with back spasms and 6 days later went on the DL the first time...on 6/1 at StL, came offthe disabled list but left that start after the first inning with numbness in the pinky and ring fingers of his righthand...the next day returned to the DL and 2 months later had elbow surgery...when injured opponents werehitting just .191, best mark in the National League...in his 9 starts the Reds went 5-4 and scored 48 runs (5.33r/g)...produced 3 quality starts...allowed 1 hit in 5.0 innings in a 4-3 loss vs Atl on 4/24 and 1 hit in 8.0 inningsin a 3-0 win on 4/29 vs Hou...became the first pitcher in the Major Leagues to record consecutive starts of atleast 5.0 innings while allowing no more than 1 hit since Wsh's Shawn Hill did it on each side of a trip to thedisabled list in 2007...became the first Reds pitcher with similar consecutive starts since Ron Villone did it in1999 (1 hit in 7ip on 6/24 at Hou, 1 hit in 8ip on 6/30 vs Ari)...in that 4-3 loss on 4/24 vs Atl issued a careerhigh7 walks...in that start allowed just 1 hit, a solo HR by Jeff Francoeur, but threw 40 pitches in the fourthframe, during which he walked 5 batters to force in 2 runs...became the first Reds pitcher to walk 5 batters inan inning since Ryan Dempster walked 6 batters inthe bottom of the second on 4/30/03 at Col...in his next2 starts, on 4/29 vs Hou and 5/5 at Fla, didn't allowa run over 16.0 innings, the longest scoreless streakof his career...threw a career-high 8.0 innings in eachappearance...started the Dominican Republic's WorldBaseball Classic opener and suffered the 3-2 loss tothe Netherlands (3ip, 2h, 3r, 0er, 2bb, 3k, 58 pitches)...in the first inning allowed 3 unearned runs on 2 hits, 2errors, 1 walk and 1 wild pitch...in spring training went2-0, 1.19 in 5 starts and 1 relief appearance...didn'tallow a run until his 17th spring inning. In his first full season in the Major Leagues was the Reds' lone All-Star and was voted by thelocal chapter of the Baseball Writers' Association of America the winner of the Johnny Vander Meer Award asthe staff's Most Outstanding Pitcher...led the staff in victories (17), ERA (3.21) and strikeouts (206) and with196.0 innings pitched finished second on the club to Bronson Arroyo's 200ip...his 206 strikeouts tied for themost by a pitcher in his first season with the Reds (Gary Nolan, 1967)...for most of the first half led the MajorLeagues in ERA and finished the season ranked among the NL leaders in that category (8th) plus wins (17,T3rd), strikeouts (206, T2nd), walks (93, 4th), opponents' BA (.232, 5th), winning percentage (.739, T3rd),strikeouts per 9 innings (9.5, 2nd), ERA on the road (2.43, 2nd), ERA in the day (2.21, 4th) and wild pitches(10, 6th)...despite his ranking among the NL leaders in most pitching categories didn't receive a Cy YoungAward vote...also led the Reds' pitching staff with 20 quality starts...from 4/22-6/20 produced quality starts in 12consecutive apps, the longest quality start streak by a Reds pitcher since Jose Rijo had 15 straight quality appsfrom 7/6-9/15, 1993...in 20 of his 32 starts allowed 2 earned runs or fewer and in 24 of his 32 starts allowed 3earned runs or fewer...didn't allow more than 1 earned run in any of his first 8 starts, tying the Major Leaguerecord for most starts to begin a season without allowing more than 1 earned run...was the longest such streakby a Reds pitcher since Rijo held opponents to fewerthan 2 earned runs in 10 straight starts from 8/14/88(5gs)-4/28/89 (5gs) and the longest single-seasonstreak since Bill Gullickson did it in 9 consecutivestarts from 7/29-9/2, 1986...didn't allow more than 2earned runs in any of his first 12 starts of the season,the first Major League pitcher to do so since Det's AlBenton began the 1945 season with 16 such startsand the first National League hurler since Lou Fette ofthe 1939 Boston Braves held opponents to fewer than3 earned runs in each of his first 14 starts...his ERAdidn't rise above 2.00 until his 17th appearance (2.08)and didn't rise above 3.00 until his 28th appearance(3.04)...6 times recorded at least 10 strikeouts, themost 10k apps in a season by a Reds pitcher sinceMario Soto had six 10-strikeout games in 1983...in 3 other starts finished with 9 strikeouts...went 10-2,1.71 in his first 16 apps and 7-4, 4.63 in his last 17apps...3 times was the victim of blown saves...his17 victories were the most by a Reds pitcher sinceLHP Pete Schourek in 1995 (18-7), the most by aReds righthander since Soto in 1984 (18-7), themost by a pitcher in his first season with the Redssince Danny Jackson in 1988 (23 wins) and themost by a righthander in his first season with theReds since Joey Jay in 1961 (21 wins)...in his 32starts the Reds (74-88, .457) went 21-11 (.645)...in 2 of the 11 losses he started Reds batters wereshut out, in 2 more they scored 1 run and in 3others they lost in extra innings...was 1 of only5 Reds pitchers to participate in more winninggames than losing games (Bronson Arroyo, Jared Burton, Francisco Cordero, David Weathers)...on 5/23 atSD struck out the game's first 6 batters...on 5/25 at SD made his only relief appearance of the season andsuffered the 18-inning, 12-9 loss (1.2ip, 1h, 3r, 0er, 1bb, 2k, 1hr, 39 pitches)...was the 10th of the Reds' 10pitchers and threw 17th and 18th innings...following Joey Votto's 2-out throwing error in the 18th allowed agame-ending, 3-run HR to Adrian Gonzalez...fellow starter Aaron Harang pitched innings 13-16...every Redsplayer appeared in that game but RHP Johnny Cueto, who was scheduled to start the next game 2 days later...went 7-1, 1.34 in 10 starts prior to that relief outing and 10-4, 4.05 in 22 starts following that relief outing...inconsecutive starts from 6/14-6/16 faced American League East powers Bos, NYY and Tor and went 1-1, 4.42...his 13 strikeouts in a 6-5 win on 9/3 vs Pit were a career-high and the most by a Reds pitcher all season...made his final start of the season in a 2-1 victory on 9/23 at Hou in the Astros' first home game after HurricaneIke...threw a career-high 7.1 innings and in the second inning recorded his 200th strikeout of the season (BradAusmus)...was scheduled to start the season finale at StL but was scratched with tendinitis in his left knee...in Baseball America's Best Tools issue ranked third in the National League in the categories of Best Fastball(Tim Lincecum 1st, Ben Sheets 2nd) and Best Changeup (Johan Santana 1st, Cole Hamels 2nd)...on 4/27 atSF recorded his first career RBI (groundout off Barry Zito)...on 5/2 at Atl singled off Tim Hudson for his firstcareer hit (12th AB)...made 1 start and 1 relief appearance for Este in the Dominican Winter League regularseason before joining the club's starting rotation for the playoffs. Received the Nolan Ryan Pitcher of the Year Award as the best minor league pitcher in theRangers' organization...in 26 starts at Class A Bakersfield, Class AA Frisco and Class AAA Oklahoma 14-6,3.67 while allowing minor league opponents to hit just .190 overall...in 19 starts at Frisco and Oklahoma went14-2, 2.55 and limited opponents to a .183ba...among all Rangers farmhands ranked first in strikeouts (166 in144.2 innings), second in victories and fifth in ERA...began the season at Bakersfield...on 5/15 was promotedto Frisco, where he produced a pair of 10-strikeout games (6/18 at Midland, 7/14 vs Corpus Christi)...from6/18-6/28 was on Frisco's disable list with a torn callus on his right thumb but missed just 1 start...on 7/18was promoted to Oklahoma, where he posted a 5.64era in the first inning and a 0.63era after the first frame...from 8/20-8/26 was Pacific Coast League Pitcher of the Week (2gs, 1-0, 0.00, 13ip, 16k)...on 8/14 at Memphisrecorded a season-high 11 strikeouts...in that game struck out his last 6 batters faced...as a September callupwent 2-1, 4.50 in 6 starts for the Rangers...won his first 2 starts for Tex...in each of consecutive starts on9/12 at Det and 9/17 at Min recorded a career-high 6 strikeouts...threw at least 6.0 innings in 3 of his 6 startsfor Tex...posted a 3.00era in innings 1-5 and a 15.75era in the sixth inning...entered 2007 rated by BaseballAmerica as the third-best prospect in the Rangers' organization...following the season was rated the 13th-bestprospect in the entire Pacific Coast League...following the season pitched for Este in the Dominican WinterLeague (3g, 2gs, 0-2, 4.15, 8.2ip, 11h, 3bb, 10k). Spent most of the season at Class AAA Oklahoma and posted a 3.21era in 21 starts to lead all Rangersminor league pitchers...was the organization's Minor League Pitcher of the Month for June (5gs, 1-0, 0.84)...was a Pacific Coast League mid-season All-Star and PCL Pitcher of the Week for 6/5-6/11 (2gs, 1.38era)...with 130 strikeouts ranked T4th in the PCL...ranked fifth in ERA (3.21)...in 10 starts after 6/1 went 3-1, 1.49...from 6/5-6/22 threw 20.0 consecutive scoreless innings...produced 3 double-digit strikeout games, including aseason-best 11k on 7/28 at Portland in his final minor league appearance of the season...in his last 4 starts forOklahoma went 2-0, 1.90...from 7/31-8/6 was on Oklahoma's disabled list with a strained calf muscle...made 8starts for the Rangers...was promoted on 8/7...went 1-1, 3.00 in his first 2 starts and 0-5, 9.70 in his last 6 starts...in a 5/4 win on 8/12 vs Sea threw 7.0 shutout inningsto earn his first Major League victory...following theseason his changeup was rated by Baseball Americaas the best in the Rangers' organization. In 22 starts at rookie AZL Rangers, Class ABakersfield and Class AA Frisco combined to finish6-9, 4.10...made his Major League debut with 3 startsand 3 relief apps for the Rangers...with 128 strikeoutsranked fourth among all Rangers farmhands...wasselected to participate in Major League Baseball'sAll-Star Futures Game and in the Texas LeagueAll-Star Game...earned the 4-0 World Team victoryin the Futures Game...on 8/30 was promoted to Tex between games of a doubleheader...made his big league debut in the nightcap vs the WSox...became thefirst Rangers pitcher to start in his debut since Chris Young did it on 8/24/04...following the season was ratedby Baseball America as the top prospect in the Rangers' organization...his fastball was rated the best in theTexas League...from 7/20-8/14 was on Frisco's disabled list with a strained left oblique muscle...made 1 rehabappearance for the rookie AZL Rangers. In 23 starts and 6 relief apps at Class A Clinton and Stockton posted a 3.83era, 10th-best among allRangers minor leaguers...opponents hit just .235...was promoted to Stockton on 7/29...in his first 5 starts for thePorts went 4-0, 2.60...following the season pitched for Azucareros in the Dominican Winter League (10g, 0-2,3.18, 22.2ip, 24k). Spent the season in the rookie Arizona League...went 1-0, 1.93 in 4 starts and 1-1,6.23 in 6 relief apps...earned his first professional save on 7/24 vs the Mariners. Made his professionaldebut in the Dominican Summer League, where he recorded 58 strikeouts in just 47.0 innings. Where do Rangers, Volquez go from here? 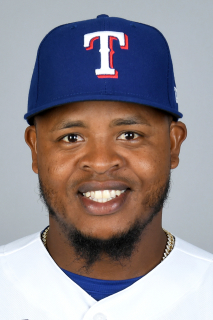 April 13, 2019 Texas Rangers transferred RHP Edinson Volquez from the 10-day injured list to the 60-day injured list. Right elbow sprain. April 5, 2019 Texas Rangers placed RHP Edinson Volquez on the 10-day injured list. Right elbow sprain. November 20, 2018 Texas Rangers selected the contract of RHP Edinson Volquez from Nashville Sounds. October 9, 2018 Nashville Sounds activated RHP Edinson Volquez from the 60-day disabled list. April 5, 2018 Edinson Volquez assigned to Round Rock Express. February 16, 2018 Texas Rangers signed free agent RHP Edinson Volquez to a minor league contract and invited him to spring training. December 13, 2017 Miami Marlins released RHP Edinson Volquez. October 2, 2017 Miami Marlins activated RHP Edinson Volquez from the 10-day disabled list. May 13, 2017 Miami Marlins activated RHP Edinson Volquez from the 10-day disabled list. May 3, 2017 Miami Marlins placed RHP Edinson Volquez on the 10-day disabled list. Right thumb blister. December 1, 2016 Miami Marlins signed free agent RHP Edinson Volquez. November 4, 2016 RHP Edinson Volquez elected free agency. May 2, 2015 Kansas City Royals activated RHP Edinson Volquez. April 27, 2015 RHP Edinson Volquez roster status changed by Kansas City Royals. December 29, 2014 Kansas City Royals signed free agent RHP Edinson Volquez. October 30, 2014 RHP Edinson Volquez elected free agency. December 13, 2013 Pittsburgh Pirates signed free agent RHP Edinson Volquez. October 17, 2013 RHP Edinson Volquez assigned to Toros del Este. October 11, 2013 Los Angeles Dodgers activated RHP Edinson Volquez. October 3, 2013 Los Angeles Dodgers reassigned RHP Edinson Volquez to the minor leagues. August 30, 2013 Los Angeles Dodgers signed free agent RHP Edinson Volquez. August 26, 2013 San Diego Padres released RHP Edinson Volquez. August 24, 2013 San Diego Padres designated RHP Edinson Volquez for assignment. December 27, 2011 RHP Edinson Volquez assigned to Gigantes del Cibao. September 3, 2011 Cincinnati Reds recalled Edinson Volquez from Louisville Bats. July 7, 2011 Cincinnati Reds optioned Edinson Volquez to Louisville Bats. June 7, 2011 Cincinnati Reds recalled Edinson Volquez from Louisville Bats. May 23, 2011 Cincinnati Reds optioned Edinson Volquez to Louisville Bats. November 30, 2010 RHP Edinson Volquez assigned to Toros del Este. September 7, 2010 Cincinnati Reds recalled RHP Edinson Volquez from Dayton Dragons. August 31, 2010 Cincinnati Reds optioned Edinson Volquez to Dayton Dragons. July 17, 2010 Edinson Volquez roster status changed by Cincinnati Reds. June 21, 2010 Lynchburg Hillcats sent RHP Edinson Volquez on a rehab assignment to Louisville Bats. June 12, 2010 Edinson Volquez assigned to Lynchburg Hillcats. February 22, 2010 Cincinnati Reds placed RHP Edinson Volquez on the 60-day disabled list. November 16, 2009 Cincinnati Reds activated RHP Edinson Volquez from the 60-day disabled list. August 25, 2009 Cincinnati Reds transferred RHP Edinson Volquez from the 15-day disabled list to the 60-day disabled list. June 2, 2009 Cincinnati Reds placed RHP Edinson Volquez on the 15-day disabled list. Tendinitis in his right elbow. June 1, 2009 Cincinnati Reds activated RHP Edinson Volquez from the 15-day disabled list. October 29, 2001 Texas Rangers signed free agent RHP Edinson Volquez to a minor league contract.